Preparations for the 2008 Australian Veteran Golfers Union National Championships in Adelaide are well under way and organisers are expecting a bumper event. Tournament Coordinator Jeff McAllister says entries have picked up significantly for the October event but there are still plenty of places left. The championships are open to all men and lady golfers who are members of state veteran golf organisations and will be held at some of Adelaide’s premier golf course from October 12 to 17. As well as a marvellous week of golf, there are also various tour options available and you can also plot your own course, perhaps with the help of the Tourism South Australia. Just prior to the veteran’s championship, Adelaide will host the World Amateur Teams Championships, which will bring some of the world’s leading male and female golfers to contest the Eisenhower Trophy and the Espirito Santo Trophy. Most of the world’s biggest names in golf have played for these Trophies over the years, including Jack Nicklaus, Sergio Garcia, David Duval, Tiger Woods; and leading female golfers such as Annika Sorenstam, Nancy Lopez and Karrie Webb. The WATC will be a great opportunity to see the next generation of golf’s superstars from over 25 countries on two great golf courses – Royal Adelaide and The Grange. Entries for the veteran golfer championships will close on August 31. As the event draws closer, organisers are finalising the details. “The registration day on Sunday 12th October is all arranged at the Westward Ho club rooms,” Jeff McAllister says. “Port Road Sports who will supply the shirts and caps/visors will set up a marquee to distribute to those who have pre purchased and have a selection of other items for sale on the day, including bucket hats, sleeveless tops and additional clothing of interest,” he says. “The Cocktail Party is to be held on the Monday evening from 5.30 to 7.30pm and will include all drinks during that period and a large selection of finger food. “All playing venues are locked in and the final Presentation Dinner is booked at AAMI stadium at West lakes. “We hope to have room for a dance floor, depending on the entry numbers, music will be provided by the group “LA”, playing suitable popular music on the night. “We are still hoping that the Governor of South Australia will be able to attend and present the winners trophies on the night. The Right Honorable Rear Admiral Kevin Scarce is a down to earth man, a member of Backwood Golf club and a fellow SA Veteran golfer. “Tourism South Australia will have short tours available for those interested. Des’s Minibus also have day tours for the “free” Wednesday, priced from $75 to $100 per person (minimum 10 ) to the Barossa Valley, Victor Harbour and the Adelaide Hills wine regions, package lunch provided. Those interested can book on the Sunday at Registration. “There are also quite a few players booked to play at Adelaide Shores on the free day, we have reserved times for them and all interested can pay at the Pro Shop on the day. There are plenty of carts for hire also. 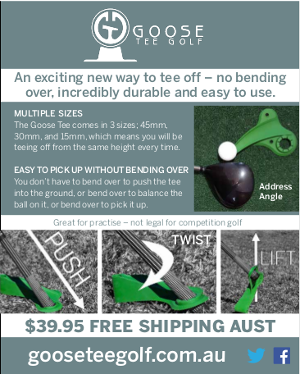 “We have negotiated with Pete Drummond Golf for Vouchers which can be redeemed at their stores throughout Australia. Other trophies will be in the form of golf balls and bottles of South Australian wine. Daily Trophies can be redeemed by the winners the next day or during the week up to the presentation night. For further details see our previous story here or visit the website of the hosts, the South Australian Veteran Golfers Association.